EXCL: Zachary Quinto on Heroes & Star Trek ! I have to admit that although I’m intrigued and captivated by Sylar, “Heroes'” most notorious dark and sinister bad guy, I am a little freaked out by the murderous villain who steals the brains of others in order to take over their superpowers. However, when I met Zachary Quinto, who plays the serial superhero killer, recently at an after party for the comedy series “It’s a Mall World,” directed by co-star Milo Ventimiglia, the star of the hit NBC show could not have been more affable and gracious. Even though I was actually at an event where I wasn’t working, I of course had to see if he’d give ComingSoon.net and Superhero Hype! an exclusive about playing Sylar and Spock in J.J. Abrams’ Star Trek. Much to my surprise, the charming breakout actor was open to the idea and gave me a great interview. Oh, and I’m no longer creeped out by the mind-thieving killer. Well, at least until the second season starts! CS/SHH! : It seems like the entire cast hangs out when you’re not shooting and you’re all friends outside out work. That’s very cool considering it isn’t always like that. Zachary Quinto: It’s very true, yeah. Yes definitely. The cast is incredibly supportive and incredibly connected and really drawn to one another outside of work as well. I think it’s part of the reason the show is so successful and people sense that in the work that we do as well. CS/SHH! : Why do you think that is? Quinto: You can never sort of predict in that dynamic of a group of people when they’re brought together. Tim Kring set out to create a specific kind of world and themes of that world are themes of unity and hope. I think the people that fell into place and fell into the step of those themes are the kinds of people who enjoy hanging out with one another. I think also everybody on the show is grateful to be a part of it and being a part of each other lives. We enjoy each other at work and enjoy each other when we’re not at work. CS/SHH! : You’re friends with Kristen Bell right? CS/SHH! : She’s joining the show for a few episodes. Quinto: She is joining the show, yeah. CS/SHH! : Did you have anything to do with that? Quinto: I’d certainly like to think so. That was a joke by the way. I think that Kristen has a real following obviously in this world and then in television in general so I’m sure that she was somebody that they’ve talked about along the way. We were at Comic-Con at the same time this year and we came back on the train with a couple of the writers and they ended up talking about this new character that they were going to have on the show. She was sort of talking to them and she forged her own relationship with them and I think that also had something to do with it. CS/SHH! : When we’re going to see her on the show? Quinto: I think you’ll see her by episode five or so. CS/SHH! : Will you two get to work together at all? Quinto: I’m not sure. I don’t know what their plans are in terms of our characters’ trajectories. I think it’s possible down the line, but you know I’m only going to be around so long on the show before I have to leave to do the movie. I’ll be taking some time off. CS/SHH! : How is shooting the movie going to work out with your schedule? Quinto: They’re in the process of figuring that out now. I’m not exactly sure. I think the movie starts shooting in November, by then we’ll probably be around episode 13 so I’ll be available and present and on a lot of the episodes before then. Then we’ll see what happens. I don’t know what their overall plan is. Quinto: I do think I campaigned for it. I definitely put it out there that I’d be interested for it. I think there was a progression that made sense to the people that are making the movie in terms of exposure and my experience of the show and the nature of the show and the sort of crossover fan base. I went in and put myself on tape for the casting directors back in April. Then I left the country a couple of days after that for a while to travel during the summer. Immediately when I got back, like two days later they had set up a meeting. J.J. had called to set up a meeting. Two days later, there was a lot of negotiating and figuring out schedules. June 7th I think is when the offer came in and then July 26th or 27th is when we announced it at Comic-Con. CS/SHH! : What kind of feedback did you get at Comic-Con when the announcement was made? Quinto: It was unanimously favorable. People were very supportive and enthusiastic and very excited. Obviously a lot of people had a lot to say about it. It was really enjoyable. It was a lot less subdued than what I was led to believe. It was very, very controlled. My biggest fear about going down to Comic-Con was that it would be out of control. It it really wasn’t and they handled it very well. CS/SHH! : Have you had a chance to spend any time with Leonard Nimoy talking about Spock? Quinto: I have spent time with Leonard and I look forward to spending much more with him. We’ve hung out a few times in conjunction with the announcement, we did an interview together and spent some time personally one-on-one. That’s the time I’m most interested in cultivating with him is really just getting to know him and learning about his life, not just about this character and his perspective on the character although it will be a significant part of the work we do together. But just knowing him as a man, knowing him as an artist. I have a profound respect for the journey that he’s taken and for the way he’s redefined his creative expression over the years. So I look forward to being a part of that and being exposed to that. I think it will be a really gratifying part of this experience. CS/SHH! : Has he given you any advice? Quinto: He’s given me some advice, sure. I think that’s part of the dynamic of the relationship and the work that we do together. This is obviously an experience that’s going to be life altering for me. He’s already been through it and I think he has a perspective that I can learn a great deal from. I feel most grateful that he’s willing to share that perspective with me. CS/SHH! : Have you watched a lot of the shows or movies to get an idea of how to portray Spock? Quinto: I have not, no. That’s not really the way I’m going to come at it I think. So, I haven’t been emerging myself in what’s been created before. I think that the key to the success of this character is probably going to be reestablishing a perspective on this character with gratitude and respect for what’s come before. Also in the sense of adventure and freedom and creating what we’re creating now. CS/SHH! : Were you a Trek fan before? Quinto: I was a fan. I wasn’t fanatical. CS/SHH! : What made you want to play Spock? Quinto: I think it’s a really interesting character and I think that exploring these characters at this point in their lives is a really gratifying exploration from a perspective of an actor. Also being able to work with J.J. Abrams and Bryan Burk and Bob and Alex who wrote the script. These are the most inventive people in Hollywood today, so the opportunity to work with them is obviously something I feel really excited about too. CS/SHH! : Since Spock is such an iconic figure, do you feel pressure to play the role? Quinto: I really don’t feel pressure. I feel nothing but support actually. It’s kind of interesting. This experience has started off on such a profound energy of support from Tim Kring, the creators and the producers of “Heroes” who supported the idea from the beginning to Paramount who supported the idea and got behind me. That’s a pretty big thing to go from never having done much film at all to being in this capacity and being in a $100 million film. I’m don’t know what the budget is, but it’s huge. Paramount has really been supportive. J.J. has really been supportive. Leonard’s been supportive. I mean, I’ve got nothing but support and encouragement along the way. I’ve found all I need to do it is sort of look to my left and there’s Leonard Nimoy and look to my right is J.J. Abrams. What more do I need to ask for? There’s no pressure in that. CS/SHH! : Are you signed on for any sequels? Quinto: It is a multiple picture deal, yeah. If there end up being sequels, that remains to be seen. There’s more than one movie attached to this one. CS/SHH! : As of now, do you know how much history of Spock from the original TV shows and movies will be incorporated or do you think they’ll start from scratch? Quinto: The interesting thing is that you meet this character before you ever knew him on the television series and the other movies, so sort of what you know about him and then also an exploration of how he got to that point. All of the characters, not just Spock. CS/SHH! : Where will the film be shot? Quinto: Mostly in Los Angeles at Paramount I believe. Then also at some other locations in and around California and also out of town. CS/SHH! : In this film, will we see any of Spock’s family or find out if he has a first name? Quinto: You’re going to have to wait and see. I appreciate your efforts, but I can not reveal. CS/SHH! : Back to “Heroes,” do you have any idea where Sylar’s story arc might be going this season or do they keep you in the dark? Quinto: I know generally where it goes and where it starts. I know where it goes for the first six episodes. The overall picture is one that is one that is revealed to us and we need it to be, not too far in advance. CS/SHH! : Can you tell us anything about the second season? Quinto: The thing that they’re pushing in the marketing on the new season is stories. It’s really true. There’s a whole host of new characters and new heroes. There’s a whole new landscape in which Sylar finds himself. I mean that literally and figuratively. Where he picks up on the second season is probably just about the last place people would expect to find him considering where we last saw him at the end of the first season. I think there is a lot to look forward to and it really hits the ground running, that’s for sure. CS/SHH! 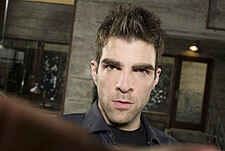 : Do you know if Sylar might appear in any of the Origins episodes? Quinto: I don’t think that at this point, any of us are scheduled to appear in Origins episodes, but that can always change closer to shooting them. But I’m pretty sure they’re probably going to be doing that simultaneously with us finishing up the season, so I don’t think there’s going to be much of an opportunity for us to be available for it. “Heroes” Season Two premieres September 24. Star Trek hits theaters on December 25, 2008.